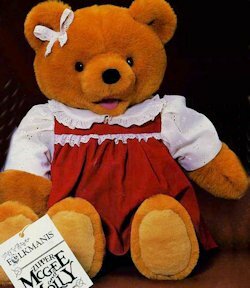 I’m looking for a Zipper Molly (partner to Zipper McGee) It’s a 1985-1988 brown bear Folkmanis Folktails Puppet. She is probably about 20-24 inches tall. She wears a maroon or red corduroy dress with white lace sleeves, collar and waist. She also has a white bow on her right ear. Molly is a puppet, so she has a hole in her back for your hand which allows you to move her mouth and make her talk. Molly is so important to me, because I would love to reunite my wife with this part of her childhood. As long as I have known my wife each time we are with her family and we begin talking about her as a child, Molly the bear comes up in the course of conversation. Molly was my wife’s favorite toy she had while she was a child. Every time we speak of Molly my wife says if there were one piece of her childhood she wishes that she still had, it would be Molly. Unfortunately, over the course of time Molly has been either misplaced or lost. I would love to be able to give my wife the joy of reuniting with this precious part of her childhood. I have them as a pair. I see my daughter on 3/31/14 to see if she wants to use them for her kindergarten classroom. thank you so much for posting. It is incredible that you have these. I’ve actually been looking for them for about 3 years… specifically the Molly bear. I don’t know if I could sway you or not but if your daughter is interested in some Folkmanis puppets for her classroom, I would gladly pay you for these two puppets the amount that you would need to purchase some new Folkmanis puppets. I would not even need to purchase both just the Molly puppet and I would gladly pay you the amount I would cost to order two new puppets. Please let me know if you’re interested and thank you again so much for posting.I hope to hear from you again soon. This would be the most amazing gift for our anniversary, that may sound strange but its true :). Sorry Monika I just realized that my auto correction changed your name to be spelled with a “C”, my apologizes. I was just wondering if you had a chance to to talk with your daughter and/or to consider my offer. I was just wondering if you had spoken with you daughter and whether or not you still have these two Folkmanis Bears. I have been looking for over two years now and you are the only lead I have ever come across. If you still have them and would be willing to part with them I would love to have them and I would gladly donate some new toys or puppets to your daughters class room (my wife is a teacher too). I truly can not think of a gift that would make my wife as surprised and happy as being reunited with Molly. If you see this message and would be so kind to respond either way I would greatly appreciate it.